I play Americans in Flames of War more often than not. This means green (olive drab) tanks, lots of them. I do not consider myself an artist, but I can sure get them looking above average – out of respect for my fellow gamers. 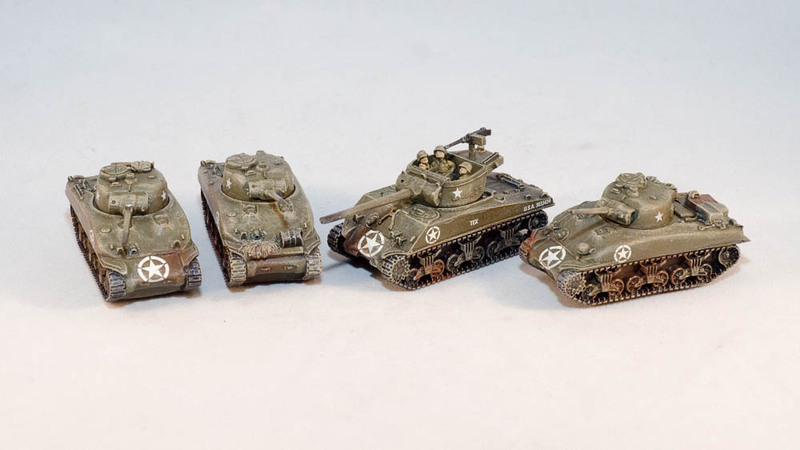 This article describes my Sherman Fast Painting Technique and the tools I use. The purpose is to get the tanks as fast as possible to the gaming table. It also allows me to build many models at once fast – I normally do at least two platoons of vehicles at the same time. At the end of the article I link to other more advanced painting techniques. Superglue – Loctite Professional – This stuff sticks in 5 seconds. Magnets – Rare earth / Neodymium – ebay.com is a good source. Underside – 1/2″ x 1/8″ round. Turret – 1/4″ x 1/16″ round. Tank Primer – Vallejo Surface Primer US Olive Drab – I normally airbrush this straight from the bottle, but it can be brush painted if you do not have an airbrush. Uniform / Commander – I paint in the same way I paint the infantry. Battlefront has several guides. This one shows colors from other manufacturers. I normally use Vallejo 988 Khaki, the same brown I use for wood for the tank helmet, and Vallejo 70.955 Flat Flesh for the skin. Wood – Vallejo 983 flat earth or vallejo 312 leather belt will do. Bags, nets, tarps and other stowage. – Vallejo 886 Green Grey. Decals – Both battlefront and plastic soldier company make very good ones. Washes – I make my own by mixing a drop of black or brown paint on SC Johnson Pledge Floor Care Multi-Surface Finish 27 OZ – those 27 ounces last a long, long time. Weathering Pigments – Any chalk or pastel dust will do, such as the ones done by TAMIYA. Shiny – Badger Air-Brush Top Coat Matte – Yes, I know it says matte – but it is shiny. Most importantly, it is cheap and it is easy to airbrush straight out of the bottle. Matte – Vallejo Matte Varnish – I thin it with water and use a couple of coats. Airbrush (but regular brushes will do). My favorite is the Badger Air-Brush Co R1V Renegade Velocity Gravity Feed. Brushes – A #1 round, #3 round and a flat one for drybrushes is all you need. Army Painter makes a good kit, but you can also find them in any hobby or arts and crafts store. Using good Brush Soap will extend the life of any brush. Decal Set – Micro Set. Assemble the whole unit with superglue. Some bloggers suggest doing the tracks separate, and I have tried that, but I differ. I like all of the spaces inside the tracks to be base coated in Olive Drab – they will acquire enough weathering and washes to darken them later. Magnetize – under the body and below the turret. Keep the magnet polarity consistent across your army. I normally keep a reference magnet so that I can always refer to it. Soapy Wash – after the glue dries, wash with soapy water to remove the release talcum that covers the miniatures. This will help the paint stick to the min. Prime Olive Drab – I use the airbrush for this. I start by priming the bottom and the tracks, then I place on a metal tray and airbrush the top part. With some care, this should cover the whole mini. Paint Black – the tracks, machine guns, tools and any stowage that you think will look good in black. Don’t worry about the tracks being a bit boring – once you do the drybrush they will come alive. Paint Details – Colors I use listed above. Paint Wood – tool handles, boxes, etc. Paint Other Stowage – normally nets, backpacks, tarps, etc. Paint the little commander, if any. Weathering pigments. I use the chalk / pastel kind. I like to use black on the tip of the gun barrel and on the engine area. Rust / mud color on the tracks and on the underside of the vehicle. I rub it on the surfaces with an old brush. I apply liberally, but you can always start with a small amount on your first models and then go from there. The shiny coat will even the coloring out and will make it permanently. Shiny coat – I do this one by airbrush – it is just easy. It helps in many ways. The decals stick to the surface better, and the wash will flow easier into the crevices it has to darken. It also offers a layer of protection to the model. Decals. Do a few at a time, and cover with micro set solution for a flat look. Wash / Ink. The floor finish + paint described above does wonders and I never run out of the colors I need. After applying a liberal ammount, mop out the excess for the desired effect – while avoiding darkening the areas that should be light anyways. Drybrush. I debate if I should do this after the wash or before it (and before the Shiny coat). Doing it after showcases the detail better, I think. Most people use an old hard flat brush for this. That is fine. I do like to use a round #10 or #12 brush with soft hairs. I dunk it in paint, then remove most of the paint on a rag. I test on my closed hand before applying to the model – test on the back of the hand – if you can see the details of your skin surface after the test brush stroke you are good to go. Matte Coat. This one I do by hand with a wide brush. I thin the matte varnish with water to avoid it whitening the paint. It does requires two or three coats. Like any wash or varnish, mop out the excess with a brush. Take nice pictures and post. A different article on that one. 2 Responses to "Flames of War Sherman Fast Painting Technique"